The Snowman-in-a-box project was very inexpensive and fun for the kids. We bought shiny rocks and knit hats from the Dollar Store and cut up clearance fleece fabric for the scarves. We used bulk white cardboard gift boxes and designed and printed the top on a glossy white paper and taped it to the box. I liked this idea so much I made my own label too! 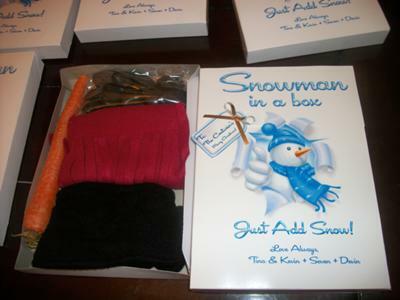 Download snowman in a box printable label.